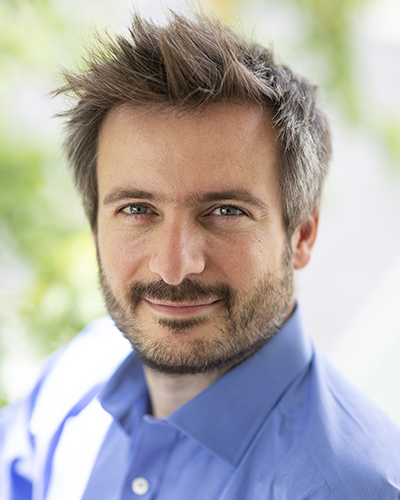 Thibaut Divoux, tenured research associate at the Centre National de la Recherche Scientifique (CNRS) in Bordeaux, France, is the recipient of the 2018 Metzner Early Career Award from The Society of Rheology. The award is made in recognition of his outstanding contributions to the understanding of shear-induced yielding transitions in soft glassy materials. Thibaut received his B.Sc., M.Sc. (2005) from ENS in Paris, and his Ph.D. (2009) in physics from École Normale Supérieure de Lyon, France. In 2009, he joined Sebastien Manneville’s group in Lyon, first as a lecturer, and then as an ERC postdoctoral fellow. Over the subsequent three years he studied the shear-induced fluidization of soft repulsive glasses and investigated elastic instabilities in wormlike micelles in collaboration with M.-A. Fardin and S. Lerouge in Paris. In 2012 he joined the CNRS Centre de Recherche Paul Pascal (CRPP) in Bordeaux and has been extending his work on shear-induced fluidization to a broader range of soft glassy materials. Thibaut is a passionate and talented experimentalist who has already made a number of incisive contributions to the field of rheology. Among the 33 articles that he has published in total, 12 articles shed new light on the shear-induced yielding transition in soft glassy materials. By means of traditional rheometry coupled to multiscale observation techniques, he has established the existence of long-lived transient shear bands. Such heterogeneous flows are strongly and intrinsically coupled to wall slip and disappear over a wide range of timescales depending on the value of the applied shear rate or stress. Using Carbopol gels (for which the steady state rheology is well described by the Herschel-Bulkley relation) Thibaut showed that the fluidization process during shear startup experiments involves a transient shear-banded flow state. The lifespan of these bands can be as long as 105 seconds, and the time to reach a linear velocity profile is a robust decreasing power-law of the applied shear rate, which does not depend on the boundary conditions or the gap width, with an exponent that is only a function of the microgel properties. The same phenomenology holds true in creep experiments, and the duration of these inhomogeneous transient processes decreases as a power-law of the imposed stress. Thibaut’s work, which has led to two recent reviews published in Annual Reviews of Fluid Mechanics and Reviews of Modern Physics, has drawn broad attention from the rheology community and triggered a tremendous amount of theoretical activity by a number of groups around the world. More recently, Thibaut has revisited a long standing and open issue in the literature, namely that of rheological hysteresis, which primarily involves transient shear-banding and heterogeneous flows. Constitutive flow curves (i.e. measurements of shear stress vs. shear rate) in yield stress fluids are commonly generated by sweeping up or down the shear rate over a finite temporal window. For a wide spectrum of complex fluids, these up/down sweeps do not superimpose and the resulting mismatch defines a rheological hysteresis loop. Thibaut proposed a cleverly designed protocol to generate these loops and, using four very different yield-stress fluids, showed that the area enclosed inside the loop displays a robust local maximum with applied sweep rate. His work points toward a single material-dependent thixotropic time scale that grows continuously from vanishingly small values in simple yield stress fluids to very large values for thixotropic materials. It provides some of the first experimental evidence that yield stress fluids do not divide into two categories that preclude one another, but rather form a single category of time-dependent materials. In a recent collaboration with the group of Suzanne Fielding (another Metzner award winner) these experimental findings have been shown to be captured by a spatially-resolved version of a fluidity model, which can quantitatively relate the rheological hysteresis to the degree of spatial heterogeneity. In addition, Thibaut’s group at CRPP has developed new test protocols for studying polymer gels, has investigated the microscopic origin underpinning empirical laws such as Basquin’s law of fatigue and the Monkman-Grant relation, and has quantified the impact of solvent evaporation on the structural and mechanical properties of polymer gels. The nomination letters emphasize Thibaut's authoritative command of the historical literature, his engaging and enthusiastic lecturing style, as well as his penchant for intricate and extended test protocols, which have helped unravel some of the complex transient phenomena that often confound simple rheological measurements. He currently pursues his research at the joint CNRS-MIT unit in Cambridge (USA), where he continues to investigate the complex transient rheology of soft polymer gels, highly-filled carbon black slurries, and pastes as well as investigating the time-evolving chemorheology of cementitious materials such as concrete. Congratulations to Thibaut Divoux, the 2018 Metzner Early Career Awardee. assembled by Gareth McKinley (Massachusetts Institute of Technology), as appeared in Rheology Bulletin, Volume 87 Number 2, July 2018.